When I was a kid in the early 80s, there wasn’t very many games that could pull me away from Pac-Man. But one of those games that did was BurgerTime. I enjoyed that game so much as a kid, that when I got home after playing it for the first time, I cut out a chef hat and pepper shaker out of paper and played ‘pretend’ BurgerTime around the house. Yeah I was a weird kid, but at least you can’t say I didn’t use my imagination! BurgerTime was made by Data East, a game company that isn’t around anymore, but they made some memorable games in the arcade back then. A few years after BurgerTime, another arcade game they made was Heavy Barrel, a top down overhead army shooter. I always thought of it as just another Ikari Warriors clone, and don’t have many memories associated with it. But I did see it recently at a retro arcade bar I went to. So taking a cue from combining other arcade games like Arkanoid vs. Space Invaders, what happens when you mix BurgerTime and Heavy Barrel? You get Heavy Burger, of course! It’s a super awesome multiplayer twin stick shooter featuring many of Data East’s arcade classics. It’s available to download on Switch and PC, but reviewed on Switch here. Yeah I know what you’re thinking, “Not another twin stick shooter!” Don’t worry, this game has enough unique gameplay elements to separate it from the rest. You play as a different colored chef Peter Pepper from BurgerTime, and can compete with one to three other chefs. Each single screen room is based on a Data East arcade game. In fact, you move around the levels via a virtual 3-D arcade! Your goal is to grab a money bag from Lock N Chase, and carry it to one side of the playfield. When you do, you’ll move to the next level with money bag in tow. But if you get shot you’ll lose the money bag. If the other player gets it and carries it to their side, they’ll move to the next level on their side of the arcade room. So it’s like a game of tug of war. Whoever can deposit the money bag in the bank at the last level wins. Similar to games like Robotron and Smash TV, you use the left stick to move and the right stick to aim in any direction. Hold the R2 trigger to fire, and the L2 button to dodge. Recoil plays a big part in this game. If you shoot and move forward, you’ll slow down. But if you shoot backwards while you move, you’ll speed up. This is an important thing to remember, as you’ll use this trick a lot to scoot around the levels. You can also pick up different guns from Heavy Barrel, like a spread shot, rapid fire, and more. Food items speed you up temporarily as well. The first and last levels are always the same, but the levels in between can be different, depending on your settings. You start out in a metallic fortress from Heavy Barrel. 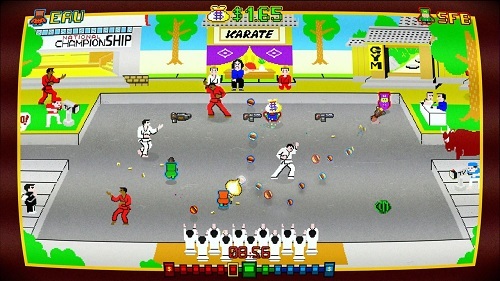 Other stages have you avoiding falling ingredients and walking food from BurgerTime, navigating mazes from Lock N Chase, dodging bouncing balls and pool table holes from Side Pocket, avoiding karate guys and charging bulls in Karate Champ, and another Heavy Barrel stage with a jungle theme and tanks and soldiers. The last level is always from Bad Dudes. You’ll need to avoid the Bad Dudes as well as bosses like Karnov and cars on the street as you make your way to the bank. Once you make it to the bank, the president will deposit your money and take you out for a burger and you win the game. I only wish there were more stages from Data East arcade games, like Joe & Mac or Karnov. You can play the game in single player or multiplayer modes. You can set rules like how many enemies there are, how difficult the CPU players will be, and what stages you’ll tackle. You can also play on teams or as a free-for-all. When you use separate JoyCons to play multiplayer, the controls are a little different, but they still work and you can still do everything you can with one player, even shoot backwards. There are also a slew of single player challenges, and when you complete a set of them, you’ll unlock screens, flyers, artwork, and history behind the Data East games featured here. Aside from not having any online modes, as the game is couch multiplayer only, the only other problem I had with the game is the price is a bit high at 20 bucks. The unlockables lead you to believe that you’ll get playable versions of the arcade classics if you complete the single player challenges, but sadly that’s not the case. It would’ve been cool if it was, though, as that would make the game TOTALLY worth the 20 bucks for playable versions of Lock N Chase, BurgerTime, and others. But as it stands, Heavy Burger is still a freakin’ awesome multiplayer game. I don’t know if it’s psychological since the game uses many graphics and sound clips from the classic games, but it feels like it could make a great arcade game, too. I highly recommend this if you enjoy arcade classics. You can shoot enemies with guns, but they just flash and disappear when shot. If you shoot another player, they just fall on their backs and make silly noises. And that’s as violent as it gets. Reading skill is helpful for some of the text, but not necessary just to play. Heavy Burger is rated E for Everyone. I thought of you when I saw the Game Grumps started playing this, cause you’ve been so hyped up about it. $20 is a bit steep, but I love when games give you little history nuggets to unlock. Disappointed you don’t unlock actual games though. I’ll have to check this out if there’s a demo or a sale. I’m not a big fan of the twin-stick shooter genre but I’d give this a try if there was a demo or it showed up on Xbox’s Game Pass.